With formal detailing, incorporating large 5½ x 5½ posts, this elegant design can accommodate lattice side extensions and/or a gate. 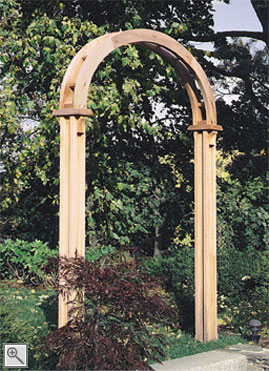 The curved top extensions are similar to those pictured with the Rockport Arbor and in the line drawing below. Also available are the tall, straight top extensions pictured below. 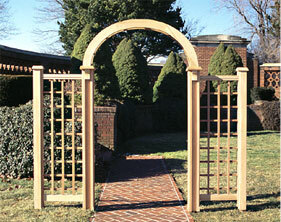 The arch is available with any of our different gate styles, as referenced in our Arbor Gates and Extensions section. The walk-through opening for this arch may be customized to any size up to 5'.